The end of British Summer Time generates a sudden and predictable peak of visitors for GOV.UK. Two interesting points emerged this year: what happens when Google seeks to answer a user's need itself, and how effective is the cross-promotion of campaigns. There was some remarkable similarity in the pattern of traffic to the page compared to 2012. Traffic to the clock change page was high (426,000 unique page views from Weds 23 to Sun 27 October) and it was the 2nd most popular landing page on GOV.UK over that time. But traffic was also marginally down on last year. We think this was due to Google introducing an enhancement to its results page for search phrases around clocks changing. This gave users an at-a-glance answer of the change date, so they may not have needed to click further. We might have been able to verify this with Webmaster Tools data on search terms and click-through rates (CTRs), but that data only goes back 3 months. We should start to archive Webmaster Tool data for future longer-term and seasonal analyses. There's an opportunity to optimise the page better. 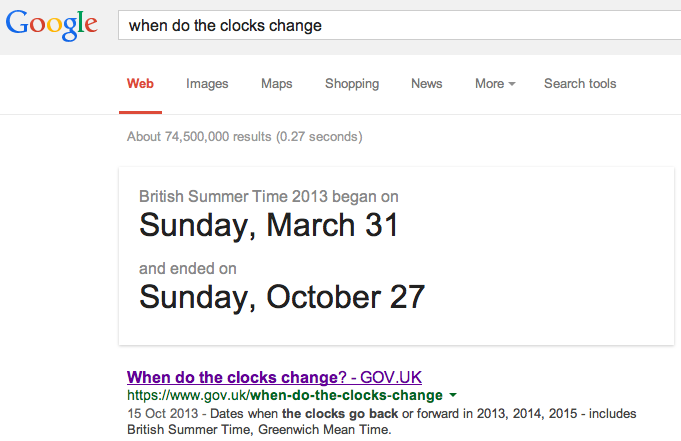 Many more people search around clocks 'going back' rather than 'clocks changing'. Our search rankings are much lower in the former and so are our CTRs. The bi-annual clock changes are a high point for the annual fire safety campaigns run by the Department for Communities and Local Government (DCLG). For the last three years DCLG has been using the clock changes to nudge people into testing their smoke alarms. The aim has been to associate the occasional domestic chore of changing clocks with another occasional and essential task of checking smoke alarm batteries. Over the clock change weekends in 2011 and 2012, DCLG found that one in seven adults tested their smoke alarm. 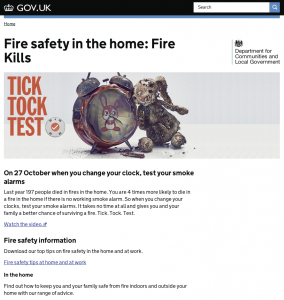 This year we experimented with publishing a small promotional cross-link to the Fire Kills campaign on our clocks change page. 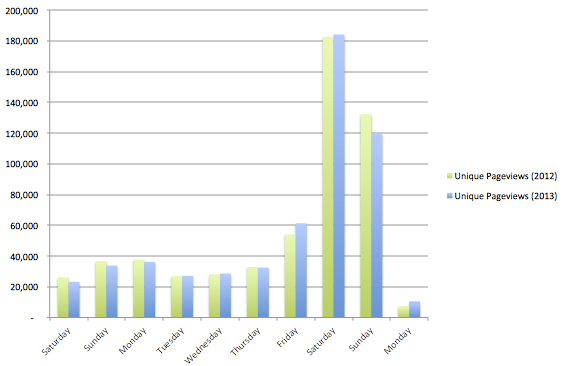 It produced a small stream of traffic, around 700 clicks in the 5 days up to the Sunday change. That's about a 0.15% click-through rate. The background activity on www.gov.uk/firekills is usually under 200 unique pageviews a day. This rose considerably over the 10-day period to around 14,500 unique page views. About 13,500 of these were entrances to the sites, so about 1,000 came from within the site. 2/3rds of those came from the clocks change page. The prime external sources were from paid activity. Because these promotions were not tagged specifically for the campaign, our analytics sees them as referrals from either the site that hosted the ad or the ad hosting network itself. Once again demand for the clock change page is remarkably high, given the number of alternative sources of this information. There were over 785,000 unique page views in October; 99.5% of them landing directly on this page. But traffic numbers fell over a period when overall GOV.UK visitors grew strongly, perhaps demonstrating that Google can offer quicker answers than we can. The Fire Kills campaign benefited a little from this influx but perhaps the connection between 'When do the clocks change?' and 'Test your smoke alarm' is not clear enough for users to take that action. More work is needed to analyse the demand for cross-promotional journeys and test the most effective ways to achieve them.